Bricks, Blocks and Rocks offers a variety of fireplace options and services. Please read below the styles and types that we can provide to you for your home or business. 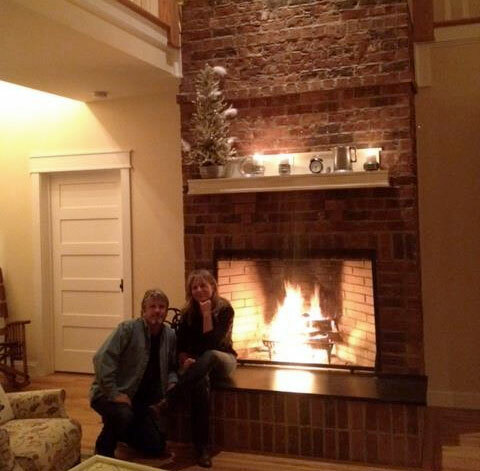 We design and build higher efficiency Rumford style fireplaces (and of course, the facial wall, liner, throat, and chimney to go with it.) Rumford style fireplaces are 30-40% efficient, while a regular box-style fireplace is only 5-10% efficient or less. It just makes sense to build this style of fireplace in any home. Rumford fireplaces are tall and shallow to reflect more heat, and they have streamlined throats to eliminate turbulence and carry away the smoke with little loss of heated room air. Rumford fireplaces were common from 1796, when Count Rumford first wrote about them, until about 1850. Jefferson had them built at Monticello, and Thoreau listed them among the modern conveniences that everyone took for granted. There are still many original Rumford fireplaces - often buried behind newer renovations-throughout the country. Environmentally responsible, all Isokern products are made of recycled, high quality volcanic pumice. Already fired once at extreme emperatures, volcanic materials offer high insulation value and exhibits reflective qualities which will make your fireplace efficient, safe and built to last a lifetime. Isokern fireplace and chimney system components have been tested to strict UL safety standards and are in compliance with building regulatory agencies in the United States and Canada. Russian Fireplaces or Russian Stoves are very large or massive masonry fireplaces. They are designed to store the heat in the stone and masonry from the combustion process. The long flue allows all the heat to be captured. Because the wood burns at such a high temperature, all of the wood burns, there is very little residual ash. This combination gives about an 85% to 90% efficiency to the heater. The long flue means that the final gas temperature leaving the stack is very cool. All of the heat captured in the masonry is slowly released into the surrounding room. After the initial burn, the stove will release the heat for the next 10-15 hours. For heating a home this means one or two burns depending on how cold it is outside.